Its been a great day for feedly - the start up created by Edwin Khodabakchian and his impressive team. I have known Edwin since Oracle acquired his previous baby Collaxa. He brought a fresh new spirit to Oracle and was an inspiration to be around. My favorite are his minimalist diagrams - he can convey complex ideas and abstractions with the simplest of figures. James Governor of Redmonk and a fellow Irregular wrote this excellent post on how Southwest makes customers feel like kings by treating its employees like customers, first. I was impressed. But seems like the feedly team knows how to take customer focus to the next level. Feedly launch has been tremendously successful so far but a few people wanted to find out how to undo the install completely. What did feedly do? They immediately responded with a detailed how-to and then automated in next 24 hours. I am not surprised. In several months of beta testing, I could reach Edwin almost 7 by 24 on email or IM - and he would listen to smallest of my peeves or perceived and real bugs and get them fixed. I am delighted to see the extensive support for keyboard shortcuts (just click ? when using feedly to see them). As a power Google Reader user, I was hard to please but the feedly experience won me over. Briefly, feedly is my RSS Reader of choice but it is actually so much more. In Edwin's own words, feedly is an attempt to use everything which is good in cloud service, RSS and social connectivity to create a more social and magazine-like start experience. The welcome wizard can learn from your existing personalizations - bookmarks, My Yahoo!, Bloglines, Netvibes, Twitter, Yahoo Mail, Gmail and Friendfeed - and apply them to your feedly. The what�s new? page provides a real-time summary of the most relevant content available on the web based on your interests, your reading patterns and recommendations from your friends. The annotation tool makes it easy to clip the most interesting parts of a an article and share them with your friends. It also allows you to easily search for related informations. The feedly+twitter integration allows you to easily spread the word about articles you find interesting. In context. The wall gives you a quick overview all the all the articles recommended and annotated by your friends. It combines your activity on both twitter and feedly. The dashboard makes it easy to get an at-a-glance view and manage all your favorite sources. The explore module adds a pinch of serendipity by continuously suggesting new sources you might be interested in. 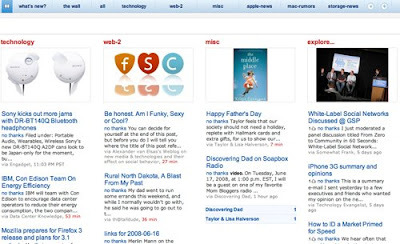 The search bar allows you to perform a personalized search across your favorite sites. The feedly API allows source owners to extend their reach by taking control over various aspects of the feedly UI. It will also allow third party developers to create new UI experiences (see cover, screensaver and feedly+flick�r for example) or weave in new annotation extensions (see Yahoo finance for example). Feedly is powered by the unofficial Google Reader API so any subscriptions you add to feedly will be added to Google Reader, any article you read or recommend in feedly will be marked as read and shared in Google Reader. And vise versa. The feedly site is open to public beta. Try it! The product and the customer service will delight you.